The Digital Department is planning to support a group of our teaching administrators through the Certified Membership, Association for Learning Technology (CMALT). This is a well-recognised portfolio-based professional accreditation. The focus is on ‘learning technologies’ but the majority of UCL teaching administrators currently use applications like Moodle, Turnitin, Lecturecast, Opinio, My Portfolio, the UCL Wiki and so on, at least to some extent. 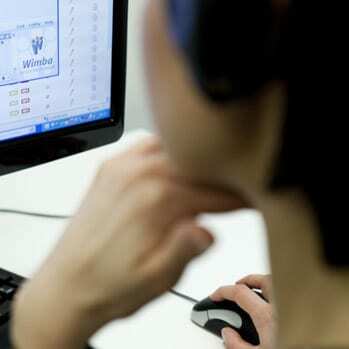 All use email to contact students, and many are experimenting with text andFacebook , even blogs and Twitter. Some also use other Web 2.0 technologies to support the student learning experience. In other words much of our practice may be applicable to CMALT. CMALT is a chance to learn about, share and implement good practice in the wide range of technologies that support our students’ teaching and learning. For further information we have circulated a short leaflet. 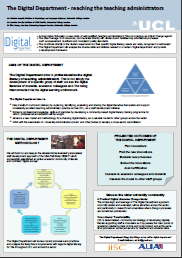 JISC Developing digital literacies programme.